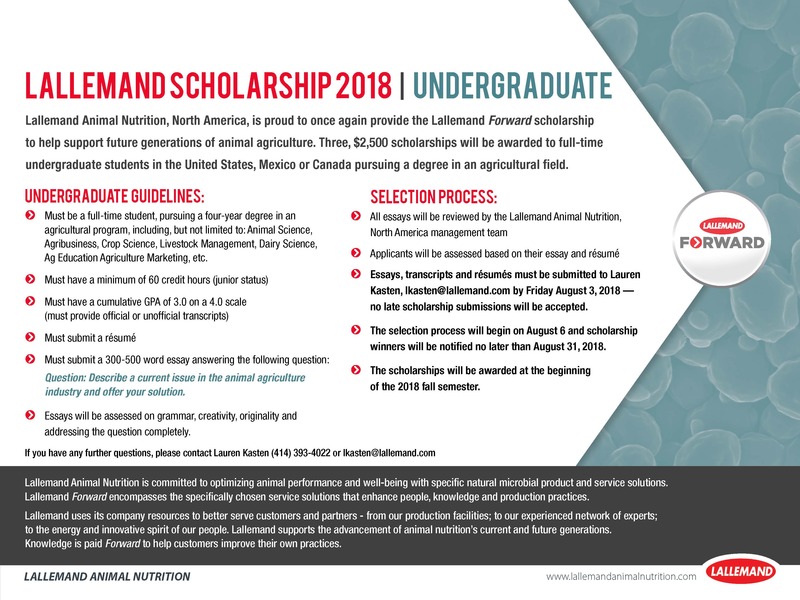 For the fourth consecutive year, Lallemand Animal Nutrition will offer Lallemand Forward Scholarships for students pursuing degrees in agriculture. 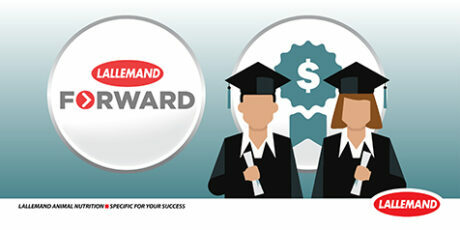 The scholarship program is available to students in the United States, Mexico and Canada. The 2018 program offers: three $2,500 undergraduate scholarships, one $3,000 master’s program scholarship and one $3,000 doctoral scholarship. Submit a résumé, transcripts and a 500-word essay on the topic: Describe a current issue in the animal agriculture industry and offer your solution. Submit a résumé, transcripts, synopsis of current work/project and a 500-word essay on the topic: Describe a current issue in the animal agriculture industry and offer your solution. 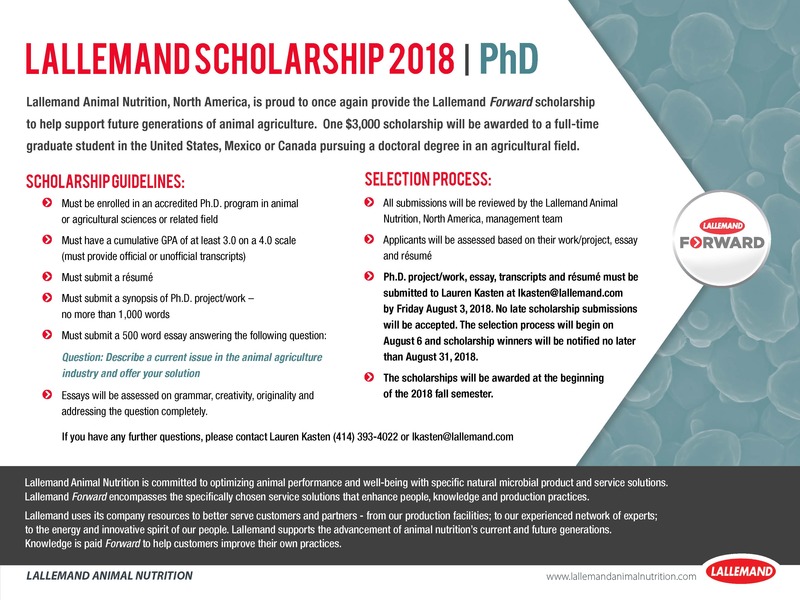 Lallemand Animal Nutrition is committed to optimizing animal performance and well-being with specific natural microbial product and service solutions. Lallemand Forward encompasses the specifically chosen service solutions that enhance people, knowledge and production practices. 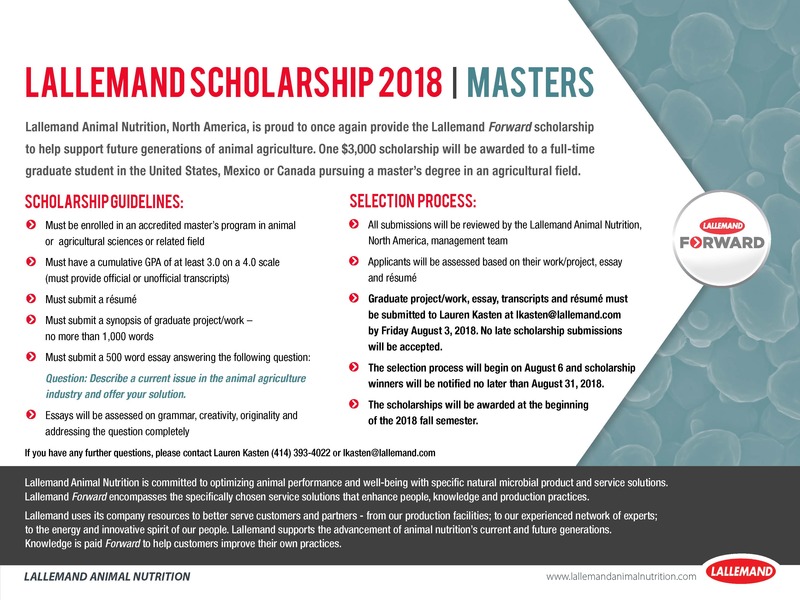 All scholarship submissions are due to Lauren Kasten at lkasten@lallemand.com by Friday, August 3, 2018. For questions regarding the scholarship, contact Lauren Kasten.